I end up downloading a lot of baseball pictures, and cards, and pictures of cards while planning posts here or on the Twitter @Number5TypeCard. Today's post spills those photos onto the blog table like a family album of summer and fall recollections. 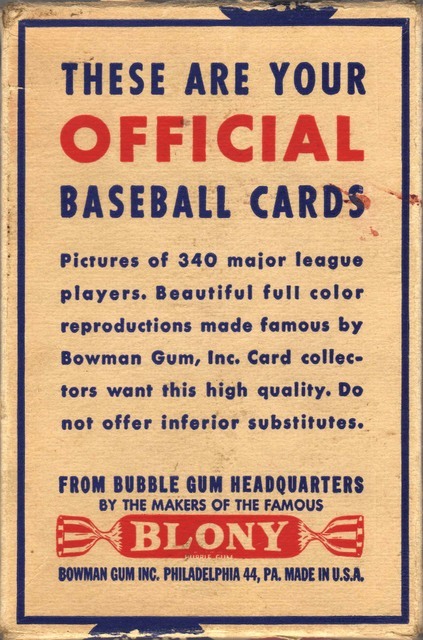 World Wide Gum, a Canadian affiliate of Boston-based Goudey Gum, marketed their 1936 baseball set as "Play Ball Bubble Gum" and this is one of their ad placards. Still boggles my mind that a photo card + gum + wrapper + distribution could generate a profit on 1 cent. Another 1930s throwback, this pair of fuzzy eBay scans come from the Goudey's obscure 1935 Knot Hole League Game set; see my relevant post for more. Fronts had the Cards/Tigers matchup from the 1934 World Series and backs had in-game plays. 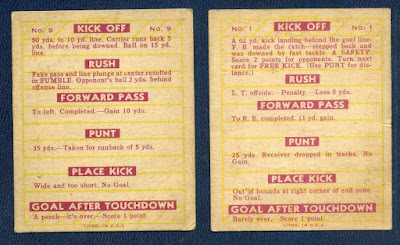 You were supposed to obtain enough of them to flip through a full game and keep score on the front. 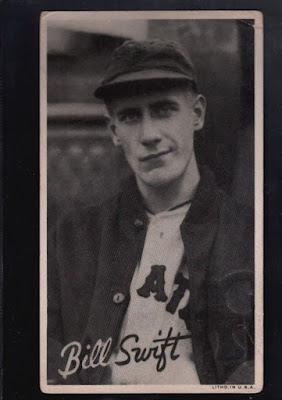 This flip game carried over to Goudey's 1936 set of black-and-white player photos. "CAUGHT NAPPING BY A SIZZLING STRAIGHT PITCH." Vin Scully might still say this during broadcasts. 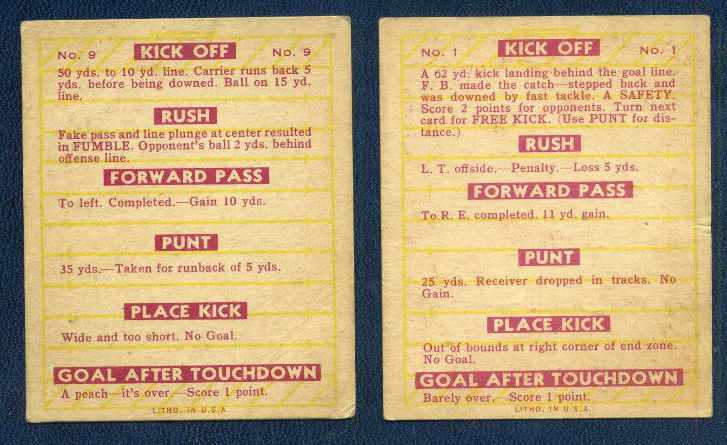 Play result cards for two 1933-34 Goudey Varsity Football, an older cousin to the Knot Hole League game set. Not easy to find, whether singles or lots. This is a modern, made-for-collectors homage to the late-40s PCL team sets sponsored by San Francisco men's clothier Sommer & Kaufmann. It's not really a reprint, as those sets covered 1948-49 and I believe this is based on 1950 team photos of the SF Seals. More pitchers from the Sommer & Kaufmann set. Give me a high leg kick over a static pose any day. Rick(e)y Henderson's minor league RC is one of the hardest on my type list and this one auctioned for over $3K. I'd expect to spend $1K+ for one at any grade. Found this terrific Wheaties panel of a leaping Joe DiMaggio right after the Supermoon Eclipse happened in late Sept. I love the moon-like color and composition here. I tracked down a scan of this special 1962 Venezuelan #200 of "Little Louie" for context in my post on the last Venezuelan type I needed, 1968 NL HR Leaders #5. 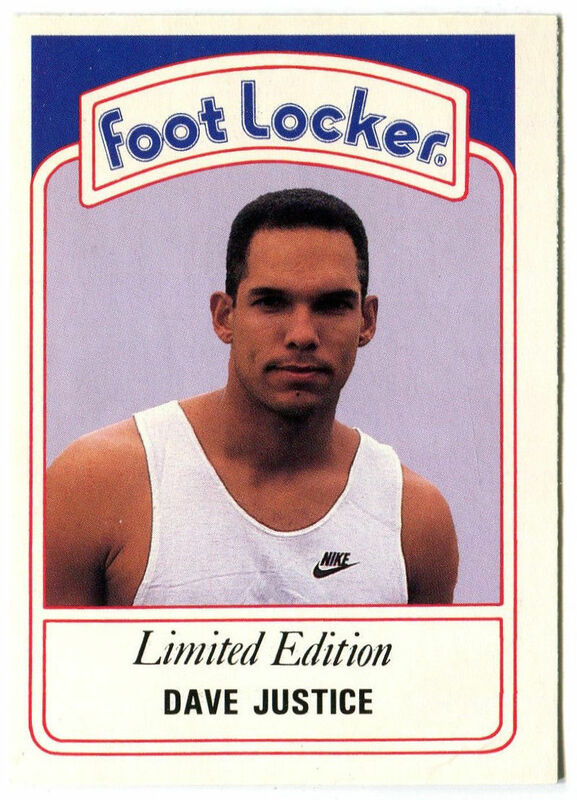 His regular Topps card is #325, but the Venezuelan set stopped at #200 that year, so the printer moved their local hero to an accommodating spot. HOF Tris Speaker in a Boston uniform, but printed after his move to Cleveland. Note backwards photo and "IFC ©" in the lower-right corner, one of many peccadilloes for the 1916 W516 strip set. Still not satisfied that I (or the whole hobby) has an authoritative understanding of this set and its variations. 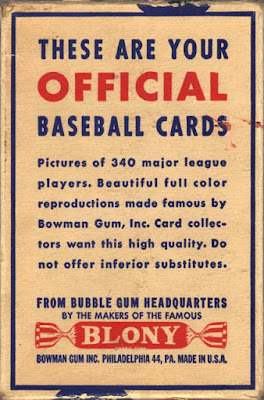 Bowman box panel for their early-1950s baseball packs. In this context, "inferior substitutes" meant that upstart Topps Gum company. Don't be deceived by kids wanting their big cards and star players! Buy more Bowman! Grabbed this scan of Manny Mota as support for my 1951 Bowman #5 profile of Dale Mitchell. Many was great and this is a great card. Respect to the photographer for using a fill flash and killing the midday shadows under his helmet. Also check out that NL Centennial (1876-1976) patch on his sleeve. 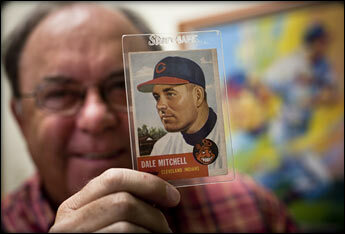 Dale Mitchell Jr. holding his dad's 1953 Topps card, also for that 1951 post. This is technically a #5, but it caught my attention for the HEY LADIES look. 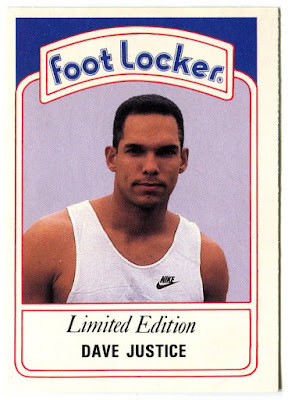 Not many cards with branded tank tops out there. 1930s Goudey Premium of Bill Swift. Cool work on the inverse text over his jacket and jersey. TRIVIA: Two men named Bill Swift have played Major League baseball. They were both right-handed pitchers and finished with nearly identical records. Baseball history: always new things to learn. 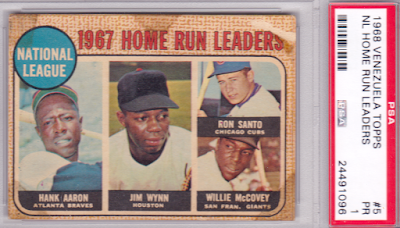 Hank Aaron, Jim "Toy Cannon" Wynn, Ron Santo, and Willie McCovey? 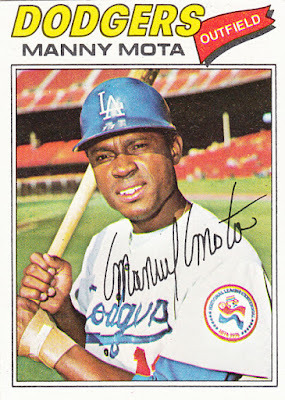 This who's-who of late-60s power hitters holds a special place in my heart as the last vintage Venezuelan on my #5 wantlist. It's got tape stains, missing paper, and creases, but you can't tell me it ain't beautiful. It was such a pitching-friendly era, these guys were the only four to hit 30+ homers in the National League that year. Most credit tall pitcher's mounds with those late-60s depressed power numbers, enough that 1969 saw a lowering of the mound to 10", the height still used today. More details on the mound's history at "Why are pitcher's mounds higher than the rest of the baseball field?" Most surprising player in a high spot on that HR leaders list? HOF speedster Lou Brock, who managed a career-best 21 big flies that year, even as he led the NL with 52 steals. Venezuelan backs don't scan well, so here's a closer look at the printing credit, "Hecho en Venezuela, C.A. Lithoven." 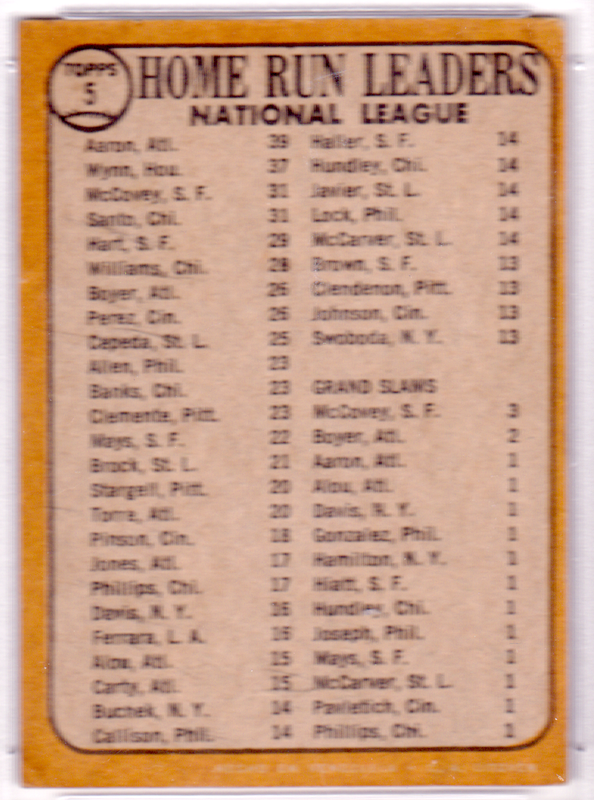 Topps executives kept tabs on the Central & South American baseball market throughout the 50s and 60s, so I assume their periodic licensing to local printers like Lithoven made financial sense, especially as more native sons entered the MLB, spurring more national interest. 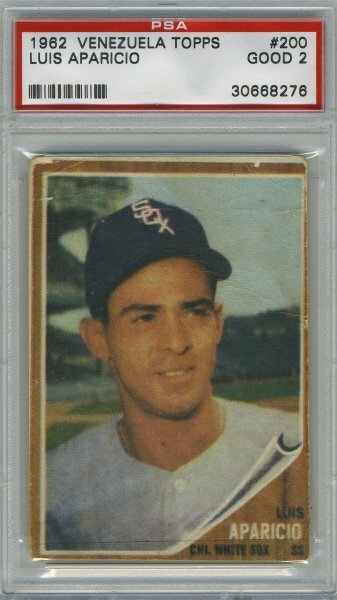 Their 1962 set, for example, included Venezuelan-only cards for Elio Chacon (see my 1962 set profile) and Luis Aparicio (below). 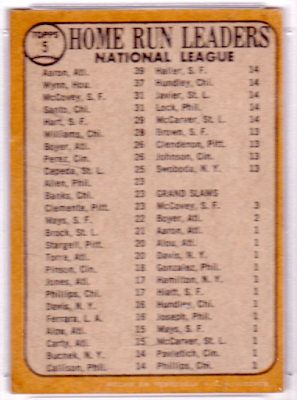 The 1968 Venezuelan set tops out at 370 cards, a few hundred less than America's version, with Mickey Mantle, Nolan Ryan (RC), and Johnny Bench (RC) being the biggest names. The Topps Archives article El Fin de Invierno includes more scans and info about this final Topps parallel, but the short story is that no Venezuelan set attempted the match USA's card size and presentation after 1968. A few 1970s sets copied American player fronts, but as knock-offs rather than the real thing. One question never answered about Topps Venezuelan sets is why they skipped years through the 1960s. Rumors persist--with me as a willing participant--that many Topps unsold packs found their way to Caracas, Venezuela candy stores in the years between their licensed printings of 1960-62-64-66-68. Reselling leftovers to a baseball-hungry country seems a lot more likely than dumping stock into a nearby waterway, as the story of 1952's high numbers goes (here's a version with Sy Berger commentary). We might never know for sure, as few Venezuelan collections survived to the present day. Value: After failing to win an earlier #5 at auction for $120, I pulled the trigger on a Buy It Now listing for the same price. That seems high in retrospect for its low grade, but anything in nice shape would sell for many times that. Fakes / reprints: Venezuelan are in demand from speciality collectors and used lower-quality materials, so are at higher risk of counterfeiting than USA-made cards. Try to buy type cards from experienced foreign collectors or dealers and get to know the different back colors and other printing peccadilloes so you're adding the right thing to your collection.